Can you imagine what our nomad ancestors did when they got a fever? Do you think they took something to lower it? Of course not. And that was how we survived. Interesting, huh? A fever is an inflammation mechanism that protects the body when there is an infection. It gets it by creating an inhospitable environment for the invasive organisms: in essence, it raises the temperature so they can’t survive. All bodies can do it and have done it for billions of years. Only in the last 80 years did we start taking medicines to stop a fever. Is it dangerous to have a fever? Why are so scared of a fever? It’s a situation to which we overreact, but it shouldn’t be a cause for alarm. The percentage of cases that present bad complications (such as convulsions) is minimal. Those are the cases the pharmaceutical business has used to spread panic around fevers. If our first reaction is trying to lower the fever, what happens with the micro-organisms from which our body is trying to protect us? Not only do we stop it from battling them, but we strength them. Imagine a thief is coming and my first impulse is t close the door to protect myself, if you tie my hands, the thief will come in and also find me tied. Something similar happens with a fever: it’s a sign that your immunological system is trying to defend you. Stopping it with medicines is not only unnecessary and gets in the way of your recovery process, but it can prolong the disease. 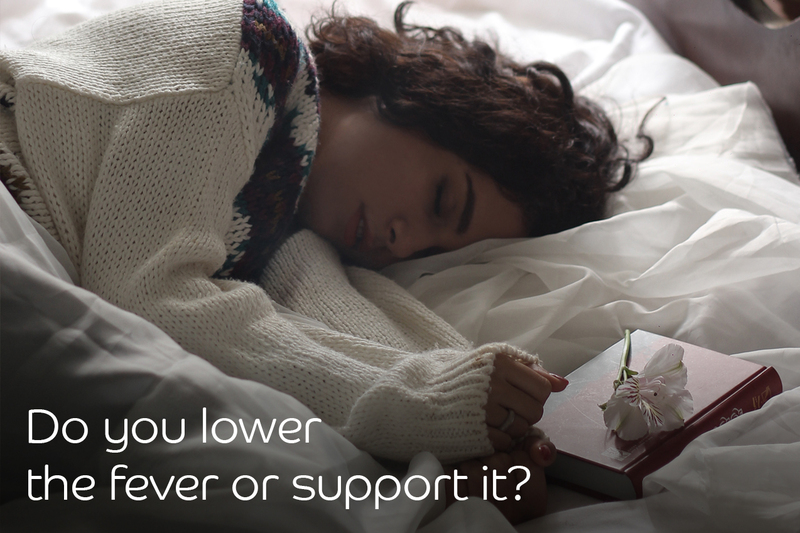 We don’t want to lower the fever, but to support it, just like other types of inflammation. When you let your immune system do its protection job, it becomes strong. It’s similar to training. It produces more antibodies, the cells that attack exactly the type of invaders that your body is fighting at that moment. No drug is this specific. It produces more white cells to fight the invading microbes. What to do when we have a fever? Not long ago my son got a fever, what did I do? Strengthen him. He is the one who is important, not the fever or the virus. Let’s not lose the focus. In order to strengthen him, we listen to his body. He wasn’t hungry, so he didn’t eat for two days, but was drinking a lot of water. Why would we make him digest if what his body wants is to fight? A very good option is to take a marrow or chicken broth, like the bone broth we make in beboon Miami. In addition, his body asked for rest, so he stayed in bed most of the time. We went out in the sun for a moment to receive the signs of nature that made us strong. We did not use anti-inflammatories or any other drug. Instead, we supported his defenses with supplements: Deep Protect and Immune Power. What did we do? We strengthened his army, so that tomorrow when his body has to fight cancer cells, it can do it. Many of us do not train our army. The day an enemy arrives, who will win? The invaders or you? My son can fight battles more easily today because we supported his body. Of course, it also gives me a feeling of restlessness to see my son with a fever, derived from my medical training and the panic that we are normally taught. What I do is monitor very closely. I observe that he is breathing well, that he is well hydrated. Only in very serious cases is it necessary to seek medical attention. It is important to monitor closely and know your body. Each case is different, but in general it is advisable to seek medical attention only if the fever is greater than 40º (in the case of adults and children above 3-years-old). The most important thing is not the fever or the invasive organisms, it’s you. If your options are taking an anti-inflammatory or resting, choose the option that strengthens your body, not the one that weakens it. Why would you kill the impulse to protect yourself from your attacker and tie your hands? Better listen to the wisdom of your body, let it fight its battles and become stronger in the process. We dedicate the month of August to talking about inflammation processes and how to support them. If you suffer from some “itis” -colitis, gastritis, rhinitis, dermatitis, arthritis, headaches or allergies – we have a specific program to support your body during these weeks. Reach out to us. Are you afraid of fevers? It’s actually a sign that your body is defending itself. Instead of playing it down with medicines, support it, it’s like training an army! You will be more prepared to battle cancer cells, for example. I’ll tell you in detail in this post in my blog. August is the month of inflammation, which is at the root of all chronic diseases. If you suffer from some “itis” – colitis, gastritis, rhinitis, dermatitis, arthritis, headaches or allergies – we have a specific program to support your body. 10 days to support the mechanisms of inflammation of your body, from their origin. Detoxify and strengthen your body through organic foods. ⇐ How inflammatory is your life?